Automatic Retractable Bollards - Hatfield. 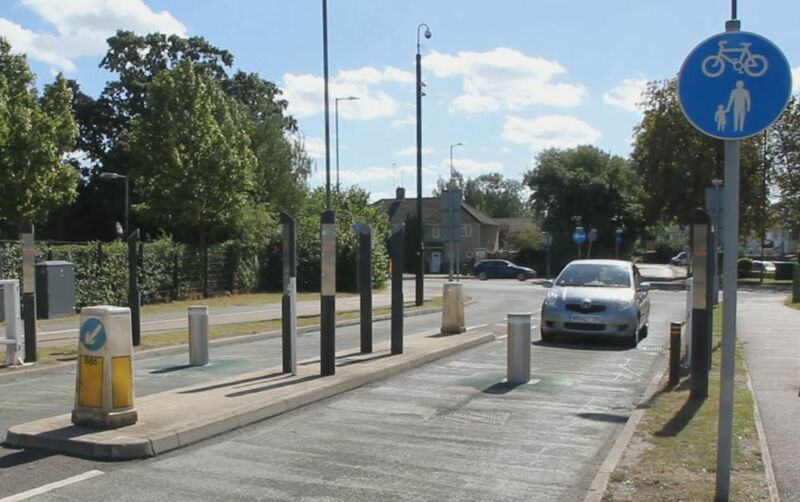 Here at Macs we're delighted with our successful involvement as Hertfordshire County Council implemented the use of a number of Macs automatic retractable bollards to improve the safety, efficiency and vehicle control of roads link for the use of vehicles and pedestrians in the area of Hatfield. Macs worked successfully with a number of companies during this project, including Eurovia Infrastructure Ltd and Videalert, who supplied and installed CCTV-based ANPR systems, that integrated into the bollard systems. The installation, based in the area surrounding the University of Hertfordshire, controls assess at two main entrances to the De Havilland Campus in Hatfield. Set within the busy college campus, housing over 2500 members of staff and a student community of nearly 25,000, the bollard systems help to provide a safe pedestrian area. The applications consists of a number of bollard stations, and were implemented to replace the existing retractable bollards. The existing systems were removed, and replaced with a number of Macs PASS 275/800 bollards. The PASS bollard range was chosen due to high traffic flow in the area, and the bollards heavy duty integrated hydraulic system. The existing traffic light posts were also replaced with more efficient LED lights, and positioned at correct distances from the bollards. The operational protocols are set out and administered by Hertfordshire Council. Combining with the Videalert CCTV-based ANPR system, the rising bollards restrict vehicle access to the campus to authorised vehicles only, such as buses. With the ANPR system reading the number plate of each vehicle approaching the bollards, authorised vehicles are recognised by the bollard controls, allowing the system to automatically allow access. The systems also incorporate the use of intercoms that allow drivers, such as bus operators, to call the control centre which can override the system and lower the bollards manually, in cases where the vehicle has not been ‘whitelisted’. The Macs PASS 275/800 security bollards were supplied in a stainless steel finish, standing 800mm high and with a diameter of 275mm. The bollards have a heavy cycle of 2 Million continuous operations and impact resistance to 40,000 Joules. For safety, the system is equipped with a ‘Safety Pressure Switch’, flashing LED lights on the bollard head, and audible warning sounder. The systems make use of 230V control boards, utilising PLC programming, to run and regulate all functions of the bollards and accessory equipment. The bollards make use of our bespoke bollard control and fault monitoring systems to report and record all aspects of system performance, status and faults. The data is fed back to the Hertfordshire County Council Control Room locally, and to Macs 24 hours a day, 365 days a year. To discuss the Macs PASS range of retractable bollards or our bespoke control system further, call today on 0161 3206462, or get it touch by email or by using our simple contact us form.